The SL State is carrying out demographic genocide at the strategic locations in the country of Eezham Tamils with the backing of New Deli and Washington that groom the Sinhala military. Just a few days ago, on 29 March, the US Navy and the Navy of genocidal Sri Lanka staged an official ‘one-to-one’ direct discussions as part of the ‘Pacific Partnership’. The SL Navy was highlighting it as ‘first-ever instance’ in Sinhala language to the public. During the genocidal war, the military of the New Delhi Establishment had a station at Pul-moaddai ostensibly for the purpose of medical assistance, but actually to coordinate ‘monitoring’. Initially, the SL military had obtained 22 acres of lands for its temporary camp at Ma’nki’ndi-malai through the Divisional Secretary. But, the camp was later extended into and the SL military is now keeping more than 180 acres of lands in the vicinity. Despite repeated calls from the Eastern Provincial Council, the Colombo government, which claims ‘good governance’ is not prepared to instruct its occupying military to release the seized lands, the civil official said. Similarly, more than 100 acres of lands remain seized at 14th Mile Post and at Arisi-malai, the civil sources further said. 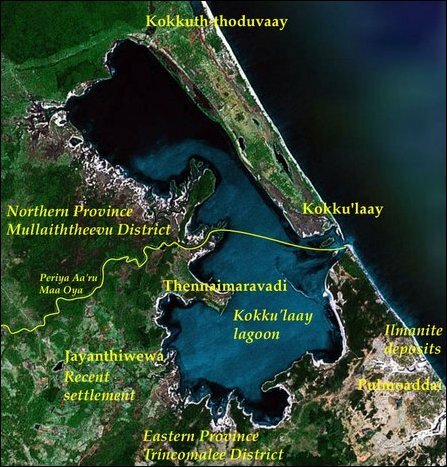 The notorious Special Task Force (STF) is also refusing to vacate from 20 acres of lands at Thoa’naa-mu’rippu. The SL military alone is using at least 500 acres of lands in the division, the civil officials said adding that they were unable to locate public lands for civil governance purposes in Pulmoaddaai. 16.01.16 Sirisena’s Mahaweli Ministry continues demographic genocide ..
20.06.15 Buddhist monk, SL military obstruct territorial contiguity o..
15.08.14 SL military seizes agricultural lands form Trincomalee Tamil..
01.02.14 Muslim fishermen in Pulmoaddai protest against Colombo’s dis..
26.01.14 SL military seizes cremation grounds of Tamils in Pulmoaddai..
08.05.13 Occupying SL military allowed to appropriate lands in Trinco..
31.01.11 Hasty Sinhala colonisation wedges north and east at Kokku’la..